Feel like bouncing, sliding, climbing, jumping, rolling, dancing, playing and a whole lot more? This is the perfect season for it. 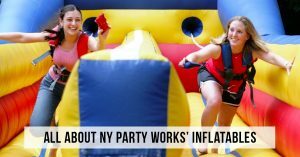 At NY Party Works, warm weather means it’s inflatables season and if you’re hosting a party or event right now you should know that when you rent our inflatables just about anything is possible. We have something for everyone and just about every type of event you can think of. So we want to let you know all about the possibilities available with NY Party Works inflatables. Let’s bounce right into it with a look at some of NY Party Works’ popular bouncers. We have bouncers available in all types of sizes because we know that even though they need to be set up outdoors and take up space, some customers have more space than others. If you have a bit more space you can try some of our 15 X 15 bouncers which are great for parties for children under 10. One of our most popular bouncers for kids is our 20 X 20 castle bouncer which gives parents a good view of their children. Also extremely popular for kids and adults are our inflatable slides. With summer in full swing, NY Party Works 22-feet long Mungo Water slide is sure to be a hit. You can set it up wet or dry and slide the distance of two tractor trailers. We also have two other majestic slides in our 24-foot Patriotic Double Lane Slide and the 24-foot Dual Lane Slide. It’s a spectacular ride to the bottom. Our inflatables are also an awesome way to burn off some energy. We have obstacle courses, activities and all sorts of games you can play. And how about showing off some of your coolest dance moves? You can do that at your party or event with our Dance Party Dome and Lounge. You can supply the music from your mobile devices and we’ll supply the LED lights or a DJ or music from our library if you need it. Another great way to burn energy is on our obstacle courses. Our Three Sports Themed course is great for corporate events, kids parties and block parties. We also have multiple activity inflatables like our Frozen Combo which has a jumping, area, slide and a basketball hoop for your kids to interact with. If your kids are feeling in a more heroic mood, try our Justice League Combo. If you want to play games, we’ve got them. Remember Hungry Hungry Hippo from when you were a kid? How would you like to be the hippo? You can do that with NY Party Works Hippo Chow Down. You can try to roll yourself down the lane with our Human Bowling or try your hand on our Mechanical Bull or Mechanical Shark. We’ve told you about a number of great inflatables available at NY Party Works, but we’ve really just scratched the surface. Many of our inflatables fit in with popular themes for parties and events, so talk to us and let us know what you’re looking for. For more information, contact us today.